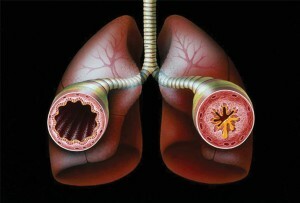 This section of the Asthma & COPD Center website is intended to provide general information about the nature of asthma. Here you will find basic facts about asthma that will help you better understand this complex disease. Asthma is a chronic disease that causes the airways of the lungs to swell and narrow, which is known as inflammation and bronchoconstriction. Some common symptoms of asthma include wheezing, coughing, shortness of breath, and chest tightness. There is currently no cure for asthma, but advancements in asthma research, care and management are happening everyday. Asthma can be controlled and managed well with a combination of specialized medications and preventative measures. Asthma is caused by triggers and these vary from individual to individual. It is important for a person with asthma to know what their triggers are so they can stay healthy. Some examples of asthma triggers are ragweed, pollen, dog and cat dander, upper respiratory infections, mold, and dust.